State Bank of India issued the required eligibility criteria for the Probationary Officer Recruitment 2019. Willing aspirants can check the complete SBI PO Eligibility Conditions 2019 once before applying. Applicants can go through the following sections to get the SBI Probationary Officer Educational Qualifications, Age Limit, and Experience. Aspirants can refer details at www.sbi.co.in Website. SBI Recruitment Board released the Probationary Officier Notification for 2000 vacancies. This SBI PO Recruitment 2019 is such great news for the candidates who are preparing for the SBI Jobs. So, interested candidates can check the required eligibility conditions for the SBI Probationary Officier Posts. If you are satisfied all the essential qualifications, then you are eligible to apply for the SBI PO Vacancies. The State Bank of India PO eligibility criteria is must consider while applying for the jobs. So, candidates should check the required SBI PO Educational Qualification, Age Limit, and Experience details and then only proceed to the online application. We have provided the essential academic qualifications for the SBI PO Jobs 2019. 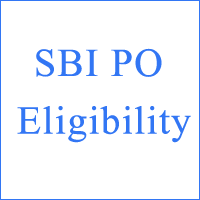 In this section, candidates can get an idea about the required SBI PO Academic Qualifications. Aspirants must be completed their graduation from the recognized University/Institution or any equivalent qualification from the recognized institution by Central Government of India. Applicants who are pursuing the final year/semester in the graduation can also apply for this SBI Recruitment. But they must produce the proof of graduation while attending the Interview. Candidates who have the IDD (Integrated Dual Degree), must check your IDD passing date is on or before 1st July 2019 to apply for this SBI Jobs. Candidates should possess all the above SBI educational qualifications. If they don’t, then candidates are not eligible for this SBI Recruitment. Applicants can check the Age limit conditions for SBI PO Vacancies. We have also provided the upper Age relaxation conditions for the reserved candidates. Candidates age should between 21 to 30 years. Aspirants should not be born before than 02nd April 1986 and later than April 1st, 1995. Applicants can attain the Upper age limit conditions for the reserved categories in the below table. Candidates can stay connected with us through www.ibpsonline.co.in Website to get the further SBI PO Recruitment updates such are Exam dates, Admit Cards, Results, etc.